WE Knife Co. has launched at the end of August 2018, the new brand CIVIVI with the aims to produce low-budget EDC knives, but with the same manufacture quality to which the Company from Guangdong has accustomed us. The project is audacious but not impossible for WE Knife, which presented three folding knives of the new brand: Praxis, Naja and Baklash. 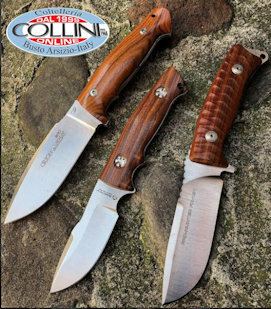 These first three models, which will all have a sales price of $ 50 in the US and approximately € 65 in Europe, are made with a 9Cr18MoV (58-60 HRC) steel blade and with 3 mm thickness. From an economic point of view the steel is very convenient, but it still offers good performance - for common uses - in terms of corrosion resistance and cutting edge retention. All models have liner lock mechanism, ceramic detent ball, flipper opening and the blade rotates on steel ball bearings. The blade, in opening position, comes to rest on the stop pin placed between the steel liners - lightened with milling - and which have various colors depending on the model. The pivot, which is also made of steel like the rest of the screws, has the logo of the brand on one side and the disassembly / adjustment T8 torx screw on the other. All mechanical couplings are made to perfection and the blades are perfectly centered between the folders in closing position and, once opened, they are firm and free of play. The scales and spacers are made of G10 of excellent quality and with different colors (there are 3 variants for each model). The deep carry pocket clip, the same in these first products, is steel made and has an ambidextrous tip-up configuration in Praxis and Baklash models, and only right side tip-up in the Naja model. Naja is characterized by a wide leaf shape blade (about 34 mm at its widest point) with a swedge and a slightly recurved cutting edge near the heel; the blade length is 95 mm. The flipper tab is easy to operate and the blade rotates in a very fluid way. The rather bulging handle (designed to accommodate the corpulent blade), is made of black G10 scales (also available in orange and blue) and features a kind of grid pattern to improve the grip on the instrument. From an ergonomic point of view the handle is quite comfortable; probably for some hands the central curvature will be a bit too accentuated, but in principle it is not unconfortable. The scales are placed on top of steel golden colored liners, lightened by milling. The pocket clip is placed almost in the center of the palm, becoming imperceptible even with a firm grip on the handle. Among these first models, the one with the most aggressive aspect is definitely the Baklash, with its clip point blade 89 mm long. The hollow grind is really very thin at the cutting edge, an aspect that certainly confers higher cutting performances but that could cause a little fear as regards the resistance and cutting edge retention. On the blade spine has been milled - with extreme precision - the jimpings for thumb positioning, which can extends on the thumb ramp for a more comfortable grip. Also in this model the flipper-tab can be easily operated and the blade quickly opens, thanks to the presence of ball bearings. The G10 scales, placed on blue colored steel liners, are simple in design but functional. For this model they are available in green, black and desert. The Praxis, which among the first models presented is the one I like mostly for design and blade / handle proportions, is characterized by a 95 mm drop-point blade and a swedge which extends along the entire length of the blade. Also in this case the flipper opening makes the blade ready to use very quickly and fluidly thanks to the presence of ball bearings, which in these knives are made of steel (while WE Knife models feature ceramic ball bearings). The handle, consisting of G10 scales available in various colors (desert, black and green, as for the Baklash), unlike the other models is structured with the presence of two finger grooves. From an ergonomic point of view, the grip on the instrument is definitely comfortable and safe. Another difference with respect to the other models is given by the hole for the lanyard which in the Praxis is obtained only on the G10 back-spacer partially exposed in the terminal part of the handle. Also in the Praxis, as in the Baklash, the pocket clip is configured in an ambidextrous tip-up position. All the knives comes with a nylon pouch that includes the warranty/maintenance instruction and a cleaning cloth. The knives have been tested from a qualitative point of view, performing some cutting tests on common materials (paper, double-wave cardboard, various types of ropes, etc.). All models have shown excellent cutting skills, making very clean and precise cuts. Even the cutting edge retention has exceeded expectations, certainly thanks to the know-how that WE Knife has regarding the heat treatments of this steel. 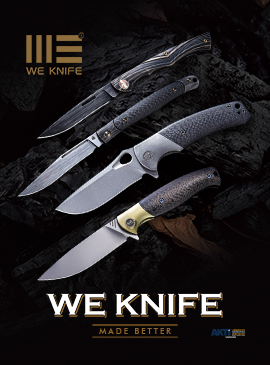 The WE Knife Co. has kept its promise, with the CIVIVI brand, to create low-budget knives but with the same build quality as high-end products. These first CIVIVI models are impeccable from the point of view of machining, mechanical couplings and finishes. Clearly the choice of steel is necessarily gone to the Chinese production, in order to keep costs low and avoid the duties to which imported steel is normally subject (WE Knife frequently uses CPM S35VN steel from USA and the European one of Bohler, like the M390), but the 9Cr18MoV proved to be a good steel for EDC knives for common uses.